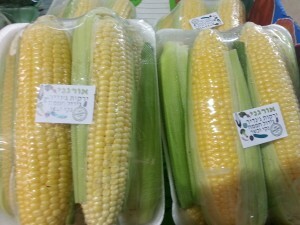 Too many shoppers in Israel are under the illusion that everything is kosher on one level or another and therefore, one can simply buy anything without concerns regarding kashrus. Unfortunately this is not the case today and we are compelled to read labels and teudot kashrut towards determining if a product is for us. 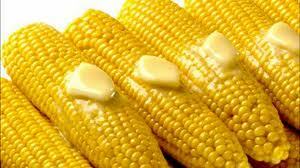 The following may be a good example regarding corn. 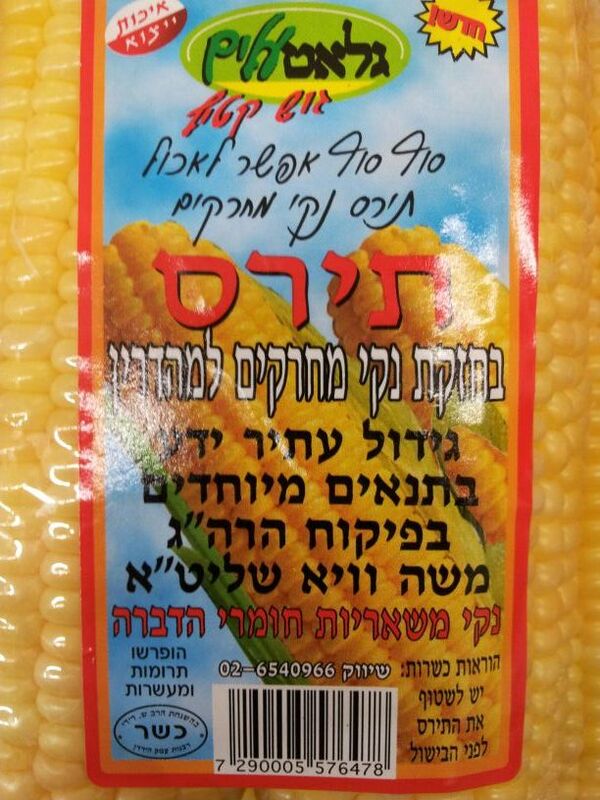 (I point out that some rabbonim are of the opinion that corn on the cob is not an issue regarding infestation while in Israel, the badatz hechsherim feel this is a problem). 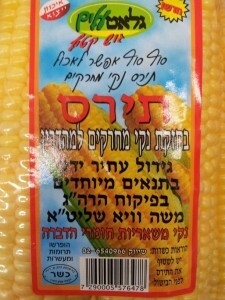 Corn on the cob from the Glatt Elim Company grown under controlled conditions, certified by Rabbi Moshe Vaye. 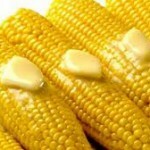 Corn on the cob claiming to be “organic” and “insect free”. It does not have kosher supervision from any rabbi or hashgacha or certification regarding its organic claim. It shows a picture of a microscope which will lead many to believe it too may be insect free. Rabbi Didi is not making that claim or assuming responsibility for such a claim. This is a good example of just how unregulated, confusing and frustrating the marketplace in Israel is. 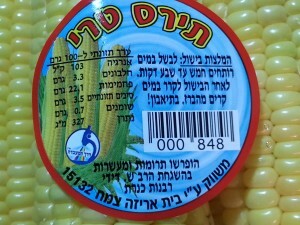 My point here is not about corn on the cob but about confusing and at times misleading labeling. Posted on November 28, 2013 by JKN Israel. This entry was posted in General Interest. Bookmark the permalink. Reading these labels is no more (and actually much less) complicated than reading the ingredients on any standard cereal box. You don’t need a degree in food science to understand the labels on the corn, just the ability and willingness to read the label carefully. Ben, if only everyone saw things the way you do. Life really ain’t so simple. photo #3: false advertising? what’s the significance of a microscope on their packaging? i see no relevance for this “microscope”! definitely can be misleading to the consumer that their produce has been microscopically checked! ha! Under what department does “consumerism” fall? IOW, which MK would be in charge of regulating the packaging of products – whether it’s produce or other? THIS IS SERIOUS BUSINESS, especially Produce & Food! I know people who import “food” from overseas and they are made to jump thru hoops and do somersaults, produce numerous documents have leases for the warehouses when the items arrive in Israel and are released from Meches [which takes forever] and for every different item that they import they have to pay another fee and complete a new set of documents – let us not forget all the stickers that have to go on the packages that must comply with the Ministry of Health and be in Hebrew. 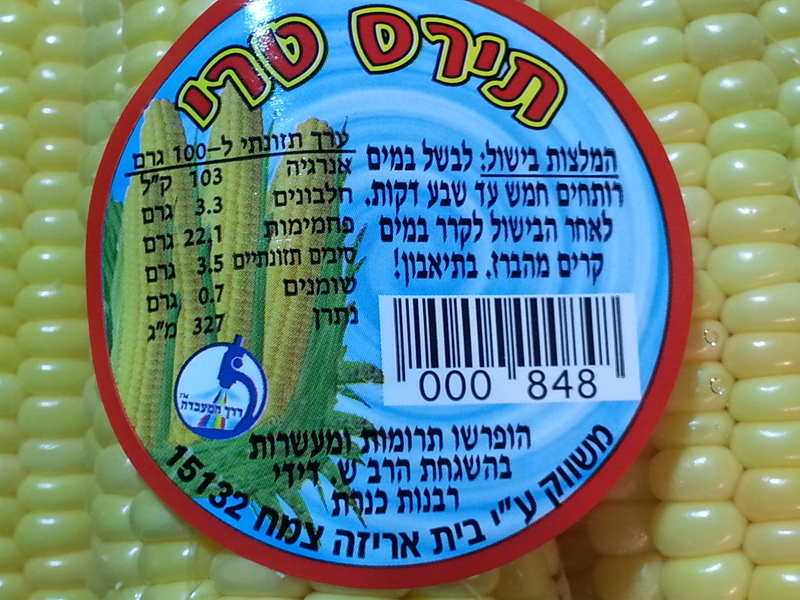 BUT, I WANT TO KNOW – HOW IS IT that I find so many IMPORTED PRODUCTS that do not have these stickers and nothing in Hebrew? HOW DID THEY GET AWAY with not complying with the rules & regulations? DEFINITELY DOUBLE STANDARDS & PROTEXIA! NO OTHER EXPLANATION! BACK TO THE TOPIC – WHO IS IN CHARGE OF REGULATING THE PACKAGING OF FOOD? My point, pithfrompinhas, is that I don’t believe that there is a problem with how unregulated, confusing and frustrating the marketplace in Israel is. I don’t believe that there is any need for the government to get more involved in kashrut issues than it already is.